Paul Huson�s Dame Fortune�s Wheel Tarot illustrates for the first time the earliest, traditional tarot card interpretations collected by Jean-Baptiste Alliette, aka Etteilla, a Parisian fortune-teller. Unlike other modern decks, the images are unadorned by the occult speculations of Mathers, Waite, or Crowley. This book is a pictorial companion to the deck. 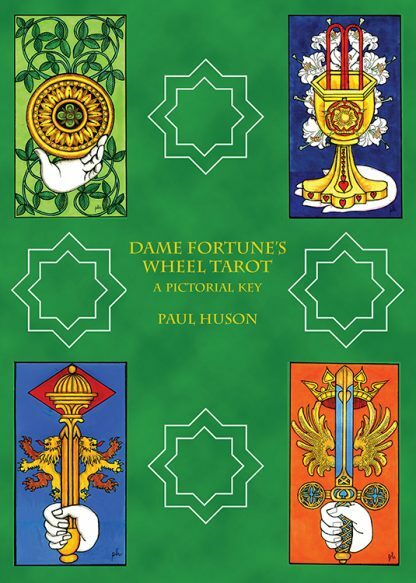 In addition to detailed descriptions of the cards� symbolism and significance�with both upright and reversed meanings�Dame Fortune�s Wheel Tarot provides meticulous full-color reproductions of Huson�s original designs for all 79 cards, including an extra Significator card specified by Etteilla that may be used optionally, and full instructions for how to lay out the cards for divination. Paul Huson, a London-born author and artist, was initially trained in the Western Esoteric Tradition by Dion Fortune�s Society of the Inner Light and later studied the doctrines of the Hermetic Order of the Golden Dawn and Stella Matutina under the aegis of Israel Regardie. He is the author of a number of well-known books on occult and allied subjects, among them the influential Mastering Witchcraft and Mystical Origins of the Tarot.